As stated in previous reviews of this work, Mr Shefski managed to spin an entertaining tale of two young men on a quest during the time of the Civil War. One of the young men, Harry confronts the tragedy of having his Mother murdered by the Shot Tower in Philadelphia, PA. 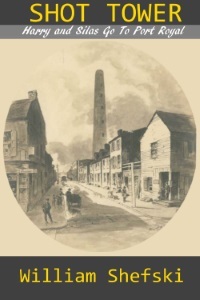 In real life this is the Sparks Shot Tower, a 200 year old gun powder manufacturer that supplied both the War of 1812 and Civil War conflicts. The tower was a source of wonderment and curiosity for Mr Shefski growing up in the section of the city where it was located. It can still be seen from the I-95 corridor through Philadelphia today. It was a very entertaining read as Harry tries to track down his Mother’s killer along with friend Silas. The suspected perpetrator is a Southerner/Confederate. The boys head south during the shank of the Civil War where the story encompasses a pleasing mixture of “Stand By Me”, Bob Hope/Bing Crosby ” Road” films and Ken Burn’s “Civil War.” The boys witnessing history and learning about themselves. This is the second work I have read from Mr Shefski. He specializes in works that have you so engaged as to not put the book down until finished. This is another of these works. Highly recommended. Previous Billy Wilder on movie writing.